Riding without a proper helmet increases the risk of a serious head injury or fatal crash by 14 times. The risk of a brain injury is reduced by 88% when wearing a proper helmet. The risk of a fatal bike crash is reduced by 75% when wearing a proper helmet. With these statistics it is no wonder why Raskullz designed their helmets to exceed all current safety standards. Raskullz Helmets are designed to be as safe as they are cool looking, complying with U.S. ASTM and CPSC standards for bicycle helmets. In the unfortunate circumstance where an accident occurs, wearing a proper helmet can literally be a lifesaver. Half of the battle is getting the child to wear the helmet, which is why Raskullz designed helmets that a child will WANT to wear. Hence the Raskullz Helmets mantra: Protect the head, inspire the imagination. Note: Please follow fitting instructions when using Raskullz Helmets to ensure helmet can protect properly. Our children have been enjoying endless hours of outdoor play this Summer. One of their absolute favorite thing's to do, is ride their bikes down the sidewalk that slopes down the one side of our backyard. While it's a convenient alternative to having them ride their bikes around the neighborhood (with the potential danger of cars), the momentum that they gain when riding down this hill makes me cringe EACH.AND.EVERY.TIME. I see them do it! While our son is a little older now, there is less of an argument about the need to wear a helmet. Our daughter is an entirely different story! She would throw a tantrum like NO OTHER, every time we would snap her old helmet on! We made sure to buy her a color that she loves (pink), we decorated it with stickers, wrote her name on it (at her request)...you name it, I tried it! However, she would STILL tug at it (while screaming) until it was removed. 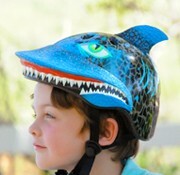 Raskullz has solved a problem for parents (like myself) with children who tantrum at the mere sight of a helmet. 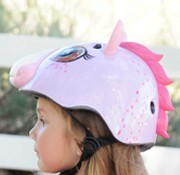 With fun animal themes, these adorable character helmets are sure to win over your little ones! The princess received the "Giddy Up" helmet by Raskullz (pictured above middle). When it arrived she was clearly excited. She asked for me to put it on her right away (though she was still in her pajama's) and there it stayed.....all day long. She ate breakfast and lunch in her pony helmet, played outside, rode her bike, did some crafts! And when asked periodically throughout the day if she wanted to have it taken off, she replied, no. The day's of fighting with the princess to put her helmet on, are long gone! I'm sure if we would let her sleep in it, she would (yep, she loves it that much)! DISCLOSURE: A product sample was provided for review purposes. I am not required to write a positive review. The opinions I have expressed in this post are my own. I am disclosing this in accordance with the Federal TradeCommission’s 16 CFR, Part 255. How clever to design a helmet that younger riders would actually want to wear! Raskullz has integrated safety and imagination for a product that exceeds standards. Living in Florida I expect to see a lot of little sharks riding around very soon. I give Raskullz two thumbs up!! These are soooooo cute. My little cousins would adore these. They're way more cool then normal helmets. I'd wear one as an adult. I agree with Nancy. 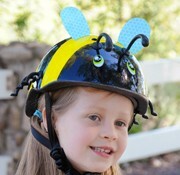 These helmets are cleverly designed to entice younger kids to wear them. Great job by Raskullz! I wish more parents were like you when it comes to safety and outdoor activities. Thank you! I agree with everyone that they are so clever to come up with safety and attractive looks all in one. I saw them at a store the other day, my only problem is that some of the things on the tops of helmet look like they could hurt the child or another child. I'm all for this idea but I am still out with my vote until I really stop and feel the material that is sticking out of the helmets.